Shortly after 08:32 PDT on 12 April 1998, the Mars Global Surveyor spacecraft pointed the Mars Orbiter Camera (MOC) towards the location of the Viking Lander 1 near 22.48° N, 47.97° W. During acquisition of the 2.7 meter (8.8 foot) per pixel (projected resolution) image, the spacecraft was about 640 km from the site, viewing down from space at an angle of 31.64 °. The local illumination conditions at the time were equivalent to a local martian solar time of 9:20 AM. The figure above shows the wide-angle view of the region during the orbit 235 observations. This view, a map projection, shows an image area of about 310 km wide by 290 km, at a scale of 300 meters (985 feet) per pixel. The green channel of this image was synthesized from the red and blue channels. Noted by a white box is the outline of the MOC high resolution (narrow angle) image (MOC 23503). A well-developed local dust storm dominates this view of the planet. Plumes from the storm suggest that the wind is blowing from lower left to wards the upper right. The slightly dark zone around the dust cloud may be surface that has been swept clean of a fraction of the mobile dust. The dust cloud obscures most of the landing site as seen in this image. This figure shows the location of the MOC high resolution image, as seen on a Viking Orbiter frame. The map-projected VO frame (027A63) shown here has a displayed scale of 28 meters (92 feet) per pixel. The Viking image was acquired on 17 July 1976 at 3:07 AM PDT. The Viking Lander 1 site is on a relatively smooth plain in Chryse Planitia. Seen in this Viking image are two important attributes of this location: brightness "streaks" associated with impact craters and irregular, almost sinuous ridges. The dark streaks pointing towards the northeast are consistent with the direction of winter, downslope winds (as seen in the present dust storm). 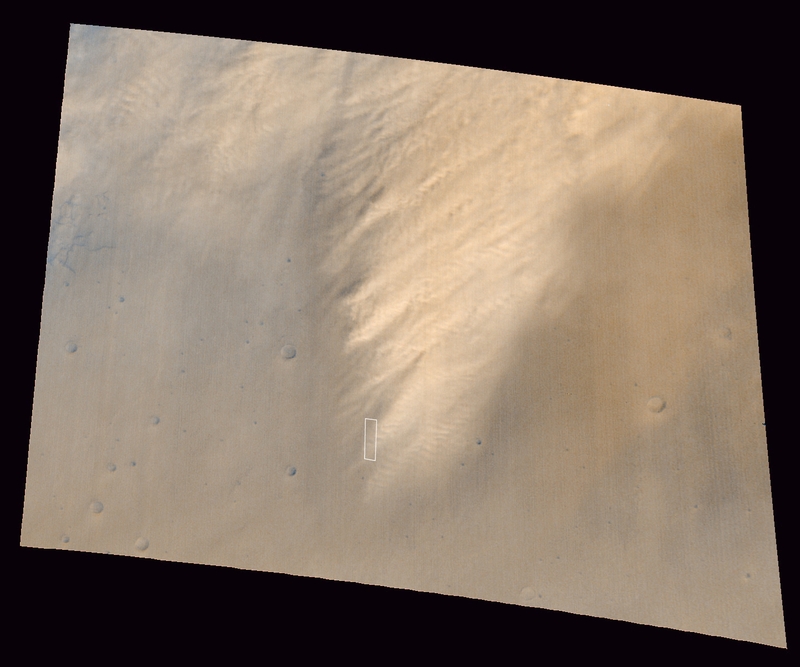 Such dark streaks usually develop as light-colored dust is kicked up by turbulence behind the crater and then transported away by the wind. The ridges are believed to reflect tectonic forces associated with the ground's adjustment to the weight of material filling the Chryse basin. The origin of the fill is not certain: it may be lava flows, flood debris, or both. This figure shows the MOC image 23503 at roughly the same scale as the Viking image (22 meters, or 71 feet, per pixel). Remarkably, despite the cloudiness seen in the low resolution wide-angle images, considerable surface detail is visible. The MOC image shows two phenomena associated with the dust cloudy atmosphere--a reduction in contrast caused by the haziness of the atmosphere and a light and dark mottling that reflects local variations in cloud thickness (not particularly the light patches at the extreme top and bottom of the image). Note that this version of the image has been processed to enhance both small detail while trying to retain the overall brightness variations. The dark band near the center of the image represents data lost during the tranmsission and transport of the image to Malin Space Science Systems. The left-hand image, above, is a section out of a mosaic of two Viking Orbiter very high resolution images, also taken under less-than-optimum illumination and atmospheric conditions. The two Viking frames (452B10 and 452B11) were map-projected to a common scale of 7 meters (22.8 feet) per pixel and portions mosaicked. The white arrow points to the approximate position of the lander, as determined by Morris and Jones (Icarus 44, 217-222, 1980) from matching features seen in lander images with features seen in these orbiter pictures. Owing to atmospheric hazes and some residual spacecraft motion-blur, the effective scale of these images is probably between 10 and 12 meters (33 and 40 feet) per pixel. The right-hand view, above, is a section of MOC narrow angle frame 23503 that covers the same area as seen in the highest resolution Viking images. This map-projected picture has a scale of 2.7 meters (9 feet) per pixel. However, defocus of the camera and, more importantly, atmospheric haze, reduces the effective scale of this image to about 4 meters (13 feet) per pixel. This scale is insufficient to resolve the Viking Lander, and the image shows no indication of the presence of the lander. The scale is also marginal for distinguishing large rocks. Some can be seen as part of the ejecta of the larger craters in the scene (especially around the fresh crater about a kilometer to the west of the landing site). Although the MOC image is about 3 times higher resolution than the Viking image, the combination of non-vertical viewing, the less-than-optimum illumination conditions, and the substantial atmospheric contribution to image degradation, all lead to an image that does not address the major outstanding questions regarding the site. Images acquired if the spacecraft passes over the landing site during the mapping mission will be substantially better.